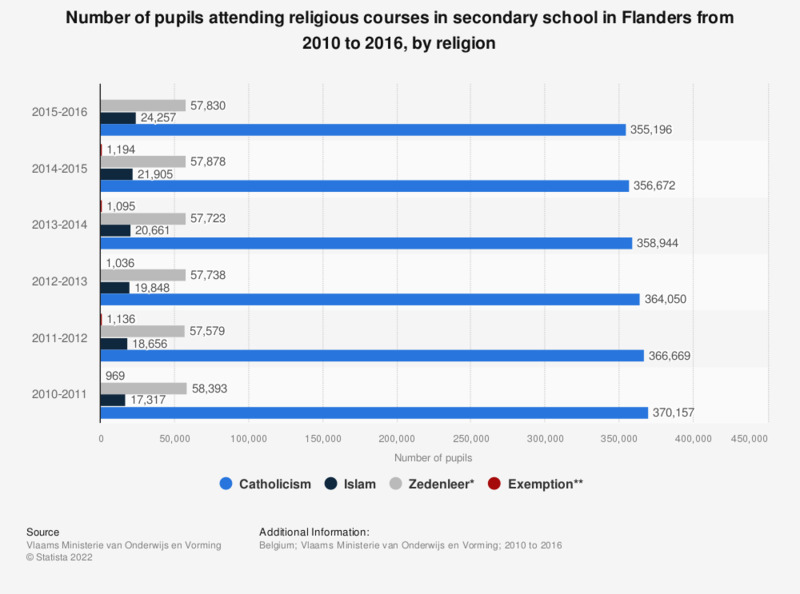 This statistic displays the number of pupils attending religious courses in secondary school in Flanders from 2010 to 2016, by religion. During the school year 2015-2016, 355,196 secondary school pupils attended classes on Catholicism in Flanders and 24,257 Flemish secondary school pupils attended courses on Islam. * "Zedenleer" has been a course in Belgium since the primary school law act of 1879 of Pierre Van Humbeeck. The course is being taught in all municipal public schools and at least in Flanders in all secondary schools. Parents have to decide whether their son/daughter attends classes on a recognized religion or on "zedenleer". Originally the course was seen as atheistic and especially anti-clerical, however, nowadays the focus is more on moral issues, critical reflection on society, human rights, free speech and such. ** Parents also have the possibility to get an exemption for their children. This means that in the time the pupil was supposed to attend religious classes, the pupil can study his/her own belief system. Everything On "Religion in Belgium" in One Document: Edited and Divided into Handy Chapters. Including Detailed References. Characteristics of public and private elementary and secondary school teachers in the U.S.